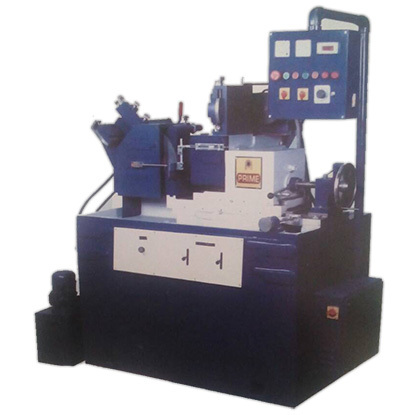 Prime Machine tools is Manufacturer Of Centerless Grinding machine with prime's Spirit of Precision And Superiority, Prime Centerless Grinders Generally Meant for metalic & non-metalic Parts For Productsction with microns Accuracy. The Machine Body Is of One Piece Close Grained cast iron. Special alloy steel with heat treated. Ground and lapped for high accuracy and long life. Special design white metal bush bearings for high accuracy and excellent surface finishing. Wheel head is mounted on double slide & swivel Plate arrangement. Specially heat treated, ground & lapped spindle runs in Oil immersed. Antitriction bearing. Give high acuracy& true running to spindle. D.C. Drive or (A.C Variable drive) provided to get ,Variable speed of regulating wheel / work piece. For achieving high production & good accuracies optimum rpm of work piece can be set. Through Feed grinding facility can achieve to tilting regulating wheel head invertical plane. For fast & accurate Taper Grinding & Taper correction. reguating wheel can be swivelled in horizontal plane by the swivel plale. Both the Grinding & regulating wheels are equipped with independent hydraulic allyoperated Trimmingunit device. Hydraulic Power pack unit housed outside the machine for easy maintenance. Infeed system can be achieve Through regulating wheel head which slide through a hardened & ground feed screw, which ensures high positioning accuracy & repeatability. Backlash adjustmentcan donebyspecially designed nut. The upper slide moves the regulating wheel head in relation to the work rest for easy job sel up & lower (feed) slide is used for feeding work to the grindingwheel. Work blades can be adjusted in height on work base for different size of components work rest base is firmly screwed to the feed slide convenience. Centralize lubrication system provide for efficient and positive lubricalion of moving parts.